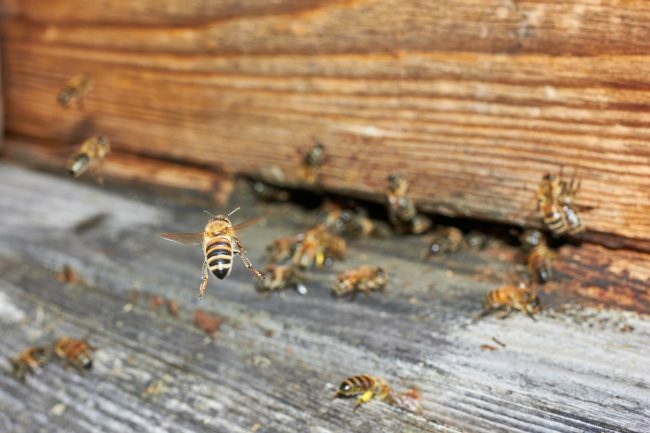 While bees and wasps are considered beneficial insects in the wild, when they take up residence in your home or business, they pose a number of threats. If you’ve encountered a nest or hive in your New Jersey or New York City property, contact Horizon Pest Control for a free consultation. Bumblebees – Measuring an inch or less in size, bumblebees have distinct black and yellow markings and a fuzzy appearance. Since bumblebees rarely nest in structures, it’s unlikely that you’ll find them inside your home. However, they may nest right outside a window or door. While they don’t cause structural damage, they can sting. Carpenter Bees – Between a half-inch and inch in size, carpenter bees closely resemble bumblebees, except that the top of their abdomen is mostly bare and shiny. They don’t nest or colonize. Instead, they bore into wood, preferring rotting wood to newly painted wood. As you can imagine, carpenter bees can deal significant structural damage. And while male carpenter bees have no stinger, female carpenter bees do. Honeybees – Smaller than most bumblebees and carpenter bees, honeybees are orangish-brown or black in color. Honeybees live as colonies in hives, and mature colonies can contain anywhere from 20,000 to 80,000 bees. They’ve been known to build new hives under eaves and in walls. Honeybees are not considered aggressive, but they will attack if a threat is detected. Hornets and Wasps – There are many species of wasps, but the three most commonly encountered in NJ homes and NYC businesses are paper wasps, yellow jackets and hornets. All three make nests from a paper-like material. The nests can be found on porch ceilings, door frames, eaves, floor joints, railings and walls. Wasps and hornets are much more aggressive than bees, so it’s important to exercise caution if you encounter a nest. Horizon prides itself on providing fast, effective extermination services to residences and commercial businesses in New Jersey & New York. If you need a bee exterminator, rely on our decades of experience in the pest control industry. Got bees? We’ve got the remedy. Call us at 1-888-824-7860 to discuss your needs.